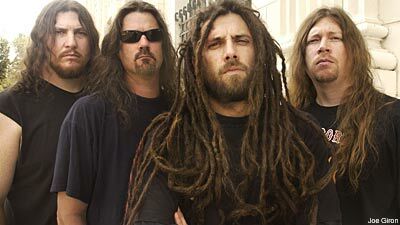 There are three Canadian songs on Six Feet Under's new covers album, 'Graveyard Classics III' -- Anvil's 'Metal On Metal,' Bachman-Turner Overdrive's 'Not Fragile' and Exciter's 'Pounding Metal' -- and it might have something to do with frontman Chris Barnes' affinity for America's neighbor to the north. "People say, 'Where did you grow up?' And they're like, 'New York City, huh?' And I'm like, 'No. I'm more Canadian than New York. I grew up in Buffalo, right on the border of Canada,'" says Barnes. "Growing up, man, when I started getting into underground and extreme metal, being so close to Toronto, Anvil and Exciter were really cool bands to me. I loved those bands and those particular songs. 'Metal On Metal' is a classic anthem, and Exciter 'Pounding Metal,' that was the second song I ever learned how to do when I joined a band. So that was a real important song to me too," Barnes said. Barnes, who saw the 2008 documentary 'Anvil! The Story of Anvil' on SFU's tour bus in Europe, doesn't know the guys in the band, but thinks he might have met lead singer/guitarist Steve 'Lips' Kudlow in Toronto "many moons ago," back when Barnes was in Cannibal Corpse. As for the BTO cover, most people are familiar with 'Taking Care of Business,' 'You Ain't Seen Nothing Yet' and 'Let It Ride,' but even this Canadian scribe had to hop on YouTube to search for 'Not Fragile' and found a fan-made, static video, declaring it "probably THE most underrated BTO song of all time." "Yeah, that's how I learned the song," Barnes laughs. "Must be the same one. It just showed the album cover or a picture of them? That's pretty much how I learned it." Metal Blade Records founder Brian Slagel suggested the song. "He's like, 'Do this.' I was like, 'Hmm, I've never heard that song.' I was familiar with their radio hits, so that was pretty interesting to me. 'I have to check this song out. OK, how do I find it? I'm thinking YouTube.' So I did have to learn that. It wasn't a real intricate song as far as the vocal goes, but it was really heavy and really cool." One of Barnes "greatest memories ever," was coming up to Toronto for New Year's Eve 1985. It was the dead of winter, but Yonge Street -- the city's main artery and the longest street in the world -- was bumper-to-bumper downtown. "We were driving like half a mile an hour, like one big party, man. It was crazy. It was mayhem," he recalls. He also recalls coming up to the Gasworks, a legendary rock club immortalized in 'Wayne's World,' "and seeing two of the best cover bands that I'd ever seen in my life," he says. "One was a Van Halen cover band and another band was an Aerosmith cover band, and both of them were just perfect, man. I'd never heard any band play better than those bands as far as cover bands. "It was lots of fun going up there as an underage f---in' kid drinking. Yeah, we could do all sorts of things. It was just hard to get across the border. That was the hardest part," he laughs.